I'm bad, I know. I buy new stamps and then they sit for long periods of time before I use them. I did it again with a huge order of PTI stamps that I bought about 4 months ago! So I broke out two sets today. This one is PTI's Tea for Two set. 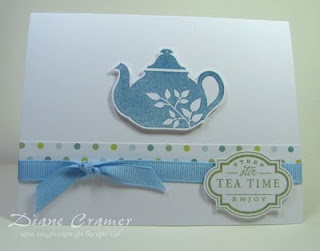 I even recycled some paper from one of the set boxes to do the narrow polka dot band. This one is PTI's Wishing You set. 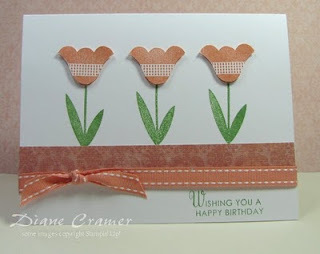 The images I stamped on the card had some "bloopers" so I restamped, cut, and popped the tulips up. It was designed for the CAS52 Sketch challenge at Splitcoaststampers. Both are very pretty. Nice colors and ribbons. Wow, Diane! These are so lovely, and the popping on the second is fab...a fortuitous fix, I say!